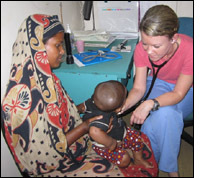 In April 2011, I had the opportunity to travel to Bangladesh and help train local health care workers to treat common pediatric illnesses, screen for malnutrition and provide direct care to patients. A portion of Bangladesh is made up of temporary islands named chars. Due to the temporality of these places people are forced to move quite often (sometimes every 1-2 years). Since there is a lack of permanent establishments, they have no access to hospitals or even proper clinics. Due to the constant movement of this population and the lack of health care records, the incidence of illness in this region is largely unknown. There is a desire to get a greater understanding of the incidence of malnutrition in the children of this area. Therefore, I trained12 paramedics, 5 community health care workers, and two counselors how to screen for malnutrition. I personally had the opportunity to screen over 160 children while I was there. I also had the opportunity to visit a medical college and major hospital to determine what resources they do have in treating malnutrition when it is picked up. We plan to make up brochures to educate on proper nutrition, improve the way that growth of children is charted and followed, and to come up with a proper referral system for children that are found to be severely malnourished. I greatly appreciate the financial support that you have given me to have this opportunity.